Students and faculty rallied with state legislators in the Capitol today calling for increased investments at the State University of New York and the City University of New York. On the Capitol’s Million Dollar Staircase, student government leaders, union officers, and over 100 student activists from NYPIRG, SUNY Student Assembly and the Educational Opportunity Program, rallied for public funding—not tuition increases—to improve the quality of public education. Together with members of the Assembly and Senate Higher Education Committees, they called on the Legislature and the Governor to close a growing gap in college revenues caused by a flaw in the laws governing TAP, the state Tuition Assistance Program. “SUNY and CUNY are recognized by millions of New Yorkers as an essential pathway to the middle class. Despite their important mission, the current funding model unwisely penalizes these institutions for educating students who receive the maximum TAP award. By closing the TAP Gap, we can make certain that SUNY and CUNY remain as world-class higher education institutions for the next generation of students. We must take action to close the TAP Gap immediately,” said Assembly Higher Education Committee Chair Deborah J. Glick. The “TAP Gap” is the growing difference between TAP funding for students and actual tuition costs. 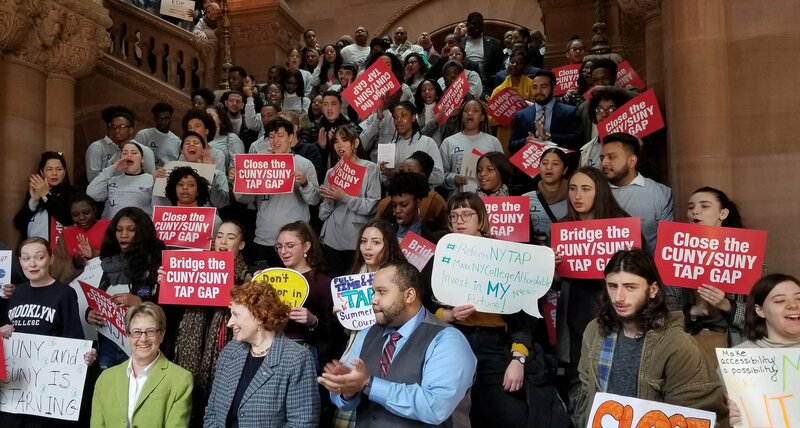 Prior to 2011, low-income SUNY and CUNY students would have their tuition costs covered in full by TAP, with colleges receiving adequate TAP payments to help cover costs for hiring new staff, funding libraries and investing in student support services. But for every tuition hike since 2011, colleges have had to cover the difference between state TAP awards and the actual tuition price for these students. The gap between what the state pays for TAP at SUNY and CUNY (up to $5,000) and the actual cost of tuition at SUNY ($6,870) and CUNY ($6,730) has left colleges grappling with a $139 million total shortfall in funding statewide ($65 million for SUNY and $74 million for CUNY). As this gap has grown — and continues to grow — students are feeling that loss in funding in their classrooms and counseling centers. "The TAP Gap is a gap students fall through. The TAP Gap hurts students when we have to worry about getting the classes we need to graduate on time, or whether we will have an assigned adviser or not, or whether the library is cutting back study hours. Personally I have to get to class 15 minutes early for one of my classes just to make sure I get a seat! Students are paying the price for the TAP Gap, and it gets worse with every tuition hike," said Smitha Varghese, NYPIRG Board of Directors Chairperson and Queens College student. Staff shortages, limited course availability, reductions in library hours and unmanageable caseloads for counselors and advisors are now common throughout SUNY and CUNY. Closing the TAP Gap is a priority for faculty, staff and students of both university systems. It’s an issue of educational quality—and educational justice. "There are deep structural problems in New York State's funding model for CUNY. As a result, the CUNY budget has reached a crisis-point: course offerings have been reduced, college libraries lack funding to buy books, and most of the teaching is performed by grossly underpaid adjuncts. New York cannot risk waiting another year to fix the funding model. Start by filling the TAP Gap, a built-in deficit-creator that is punishing CUNY senior colleges for every low-income student they enroll. Albany needs to eliminate the TAP Gap this year," said Professional Staff Congress President Barbara Bowen, Ph.D.